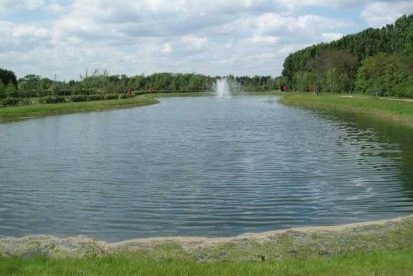 We offer design, supply and lining installation services for a range of environments including wildlife ponds, fishing lakes and ponds / slurry lagoons. 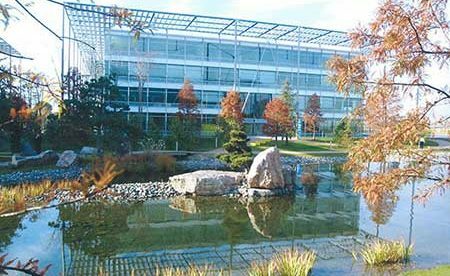 All ponds and lakes tend to become wildlife havens whether you intend it or not. Special attention is required for the construction and design of wildlife ponds. For them to be successful they must be sufficiently natural to provide all the normal habitats and foods required by the wildlife. The lining system must not detract from the natural uses of the pond. It also needs to be tough enough that visiting wildlife won’t damage it. Remember: Ducks bite! Deer have sharp hooves! Water voles dig holes to live in! Contact us now. Our engineers will be pleased to discuss your requirements and provide a quotation tailored to your specific project. 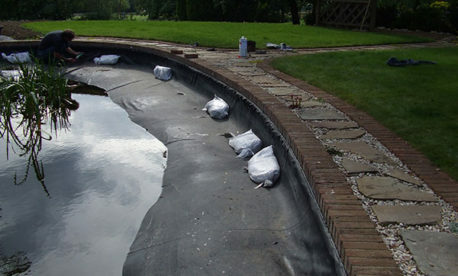 We recommend the following lining system for all lakes and wildlife ponds. Geotextile liner protection. One layer minimum 3000 CBR and minimum 2.00mm thick to prevent puncture from stones, etc. 0.75mm Butyl rubber with all welded joints. This material can deal with settlement due to its elasticity. Note: For large lakes PVC and LLDPE liners are often used as they may be considerably cheaper than Butyl rubber. In these cases a high level of ground compaction is required to prevent settlement. Geotextile liner protection. One layer minimum 3000 CBR and minimum 2.00mm thick to prevent puncture from above. Add a minimum of 50mm of ‘as dug’ soil to cover the base of the pond over the geotextile, increase to 100mm thick when the depth of water is below 1.00m. This weights the geotextile and finishes the pond. Control of water depth is also helpful, maximum depth can be controlled using an overflow weir or pipe. Weirs are achieved by lowering the edge of the liner in one place around the pond. As with all lined water features you must ensure that the highest level of natural water in the ground (the water table) is at least 0.5m below the liner level. If not, drainage will be required to prevent the likelihood of the liner lifting. All surfaces on which the lining is to be laid must be prepared so that no damage to the lining is possible. The surface should be free of all rocks, sticks, stones, roots, sharp objects or debris of any kind. The surface should provide a firm unyielding foundation for the membrane with no sudden, sharp or abrupt changes or breaks in gradient. No standing water or excess moisture shall be present. The surface must be constructed to allow the necessary compaction. 90% proctor with a surface tolerance of ±25mm for plastic materials, 80% proctor and ±50mm for rubber materials.